Autumn is by far my favourite season, I love all things knitwear, ankle boots (they're my guilty pleasure! ), lightweight coats and long dresses almost always in the traditional autumnal hues. Admittedly, my wardrobe goes over to the dark side as autumn begins - there just seems to be more available - but sticking to a lighter colour palette throughout autumn can definitely be done. You probably know these white denim culottes pretty well since the summer as I got so much wear out of them, a really good purchase from Next believe it or not (seriously, check out Next because they have some incredible finds!) I was going through my wardrobe in an attempt to have some sort of clearout/see what's currently in there that I can still get some wear out of, when I came across these denim culottes - I have them in both white and blue denim - I didn't really know what to wear so I picked out these. A bold choice seeing as winter is coming and white probably isn't the most coveted colour however, I got so much wear out of them throughout the summer, without any major wardrobe disasters, I thought there's no harm in trying. I've been seriously struggling with tops at the moment and as I haven't bought any new knitwear yet, I picked out this old favourite from Missguided which is more of an off-white cream but I think the two go really well together. I also really love the mix between summer at the bottom and winter at the top. My ankle boots are from Public Desire and these are again, so old! But I have managed to find an incredibly similar pair on Nasty Gal, here. I have my eye on a new pair of red boots actually; these red boots from River Island are limited edition and OMG I've never needed a pair of boots more in my life! Red footwear is going to be huge this season - heck, the colour red is going to be a must-have - so get to it if you haven't got any red items in your wardrobe yet. I love going for bold footwear, especially when it comes to ankle boots, so the red boot trend is giving me life! 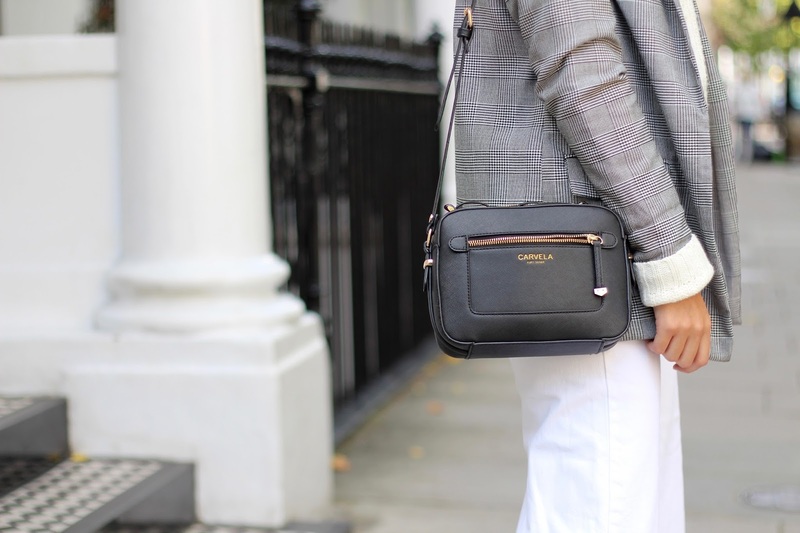 If you're a regular around here - or even if you're not - you'll probably know about - or soon get to know about - my serious obsession with crossbody bags! After adding this one to my collection half way through 2016, it has easily become my go-to bag. I love that it allows you to be hands-free (an essential if, like me, you want to be able to snap away on your phone at all times) and it's surprisingly roomy, with space for a mini umbrella - which is essential in the UK - my purse, a vast array of lipsticks and balms that I somehow manage to accumulate in there towards the end of the week, hand cream, a pack of tissues and various other miscellaneous bits like receipts and stray hairbands. Not to mention the front pocket which is now a handbag essential in my eyes, if you need an oyster card to travel with then this is life-changing as it means I don't need to rummage through the depths of my handbag to find my card holder, it's sitting in the front of my handbag and can be easily zipped away too so it's still secure. If that wasn't enough of a rave about this bag then I'm not sure what will be! The bag is Carvela by Kurt Geiger but I got this from Shoeaholics which also deserves a mention - it's basically an outlet for all things sold in Kurt Geiger (including brands like UGG, Michael Kors and Ted Baker) so need I say more? I don't think I need to go on about prince of wales check anymore am I right?! 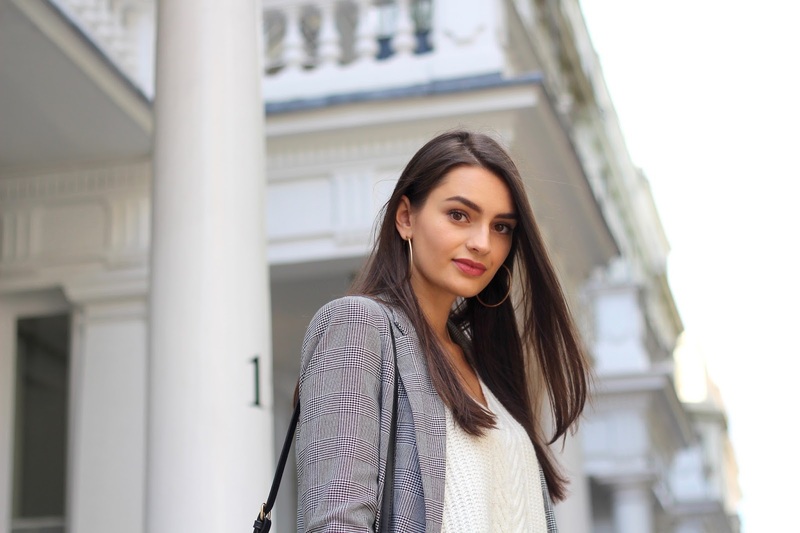 I've spoken about the seriously hot-right-now trend on my blog before (check out this blog post to see more) and also dedicated a small portion to it in my latest video: 5 Pieces to add to Your Autumn Wardrobe (watch here). Naturally, it's become a go-to of mine and so I slipped into my New Look blazer - a great find at a great price. Starting with a lighter base and accessorising with a few more autumnal bits, I think I've managed to tackle wearing light colours in autumn. What do you think?